Built to raise the profile of a distant diocese in the capital, this collection of buildings rose and fell in standing as relations between church and state changed. Nestled in a corner to the south of the Kremlin and not far from the Moscow River is an enchantingly beautiful ensemble that reflects centuries of turbulent history. Even native Muscovites are not always aware of Krutitsky Court, located by a lane of 19th-century wooden houses, yet its remarkable display of 17th-century church architecture and ceramic tiles is a unique part of Moscow's cultural heritage. The origins of the Krutitsky Court (Krutitskoe Podvorye) reach back to the 13th century and the aftermath of the Mongol/Tatar invasion of medieval Rus (1237-1241). Following the Mongol conquest, thousands of Russians were held in captivity as slaves near the center of the Horde at Sarai on the lower Volga. The Mongols respected the Russian Orthodox Church, and at the request of Grand Prince Alexander Nevsky of Vladimir, they allowed the formation in 1261 of a diocese to minister to this large group. The diocese was called Sarsky and Podonsky, reflecting the fact that its boundaries stretched from Sarai to the Don River. A decade later, in 1272, the distant diocese established a legation, or court (podvorye), on the outskirts of Moscow with the support of Prince Alexander's son Daniil, founder of the Moscow Riurikovich dynastic branch. The Krutitsky Court was located downriver from the Kremlin on the high left bank of the Moskva River at a site known as Krutitsy (from the Russian word for "steep"). Its first church was dedicated in 1272 to Sts. Peter and Paul. The Sarsky and Podonsky eparchy was not alone in establishing legations near Moscow. The Orthodox Church sensed Moscow's increasing power — already rivaling that of Vladimir and Tver — and legation gave bishoprics far from the capital a foothold near the center of political power and provided a suitable residence during the bishop's visits. Krutitsy was also located in the vicinity of two marge monasteries — New Savior and Simonov — and near a major route to Kolomna and the southeast, which was the route taken by Moscow princes during their obligatory journeys to the Horde. Descendants of Prince Daniil — notably Ivan II and Dmitry Donskoi —made important gifts to the Krutitsky Court. Funds for a new church dedicated to the Dormition of the Virgin were provided by Grand Prince Ivan II, who ruled from 1355 to 1359. The Krutitsky Court is located in central Moscow at 133 Krutitskaya St. The nearest metro station is Proletarskaya (purple line). With the waning of Tatar authority in the 15th century, few Russians remained in an area whose rulers had adopted Islam. In 1454, Bishop Vassian transferred the seat of the bishopric from Sarai to Krutitsy, and the word Krutitsy was added to the name of the eparchy. Decades after this transition, Krutitsky Court gained a new masonry Cathedral of the Dormition in 1516. With little practical connection to their original territory, the Krutitsky bishops began to play a more important role in managing church affairs within the Kremlin. By the middle of the 16th century, the Krutitsky Diocese had its own court within the Kremlin. In 1589, the year when the first patriarch of the Russian Orthodox Church was installed, the Krutitsky bishop was elevated to the level of metropolitan. 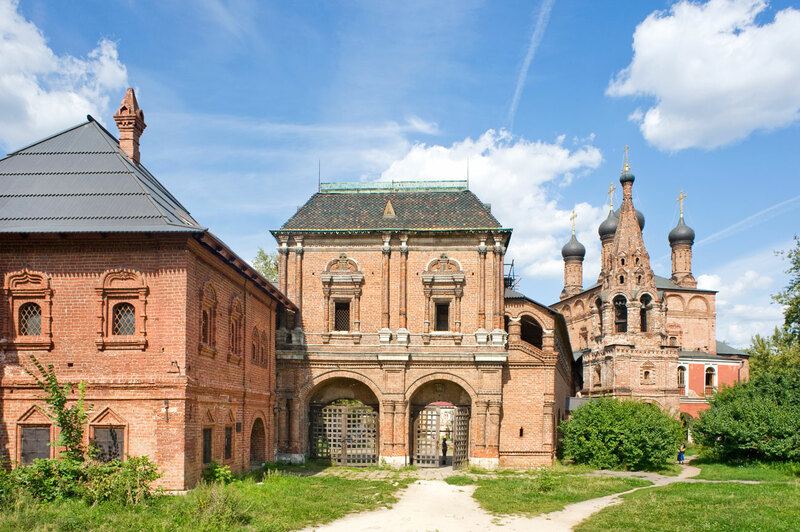 In the early 17th century, Krutitsy played a momentous role in sustaining the Orthodox presence during the Time of Troubles, a national catastrophe that lasted from 1605 to the end of the next decade and combined a dynastic interregnum with civil war and foreign invasion. There were moments in the Polish occupation of the Kremlin when the "Little" Dormition Cathedral at Krutitsy performed as a surrogate for the inaccessible Kremlin Dormition Cathedral — Russia’s main church. In 1612, the Krutitsy Dormition Cathedral was ransacked by the Poles, and became a rallying ground for the forces led by Prince Dmitry Pozharsky, which expelled the Poles from the Kremlin in November 1612. In 2012 a large votive cross was placed at Krutitsy to commemorate these events. As the situation in the country slowly stabilized after the establishment of the Romanov dynasty in 1613, Krutitsky Court also underwent a revival. Major expansion occurred during the tenure (1664-1676) of Metropolitan Pavel II, who in 1667 initiated the construction of the present Dormition Church (at that time a cathedral), with a ground floor chapel dedicated to Sts. Peter and Paul. The design of the Dormition Church, completed in 1689, was typical for the late 17th century, with a closed domical ceiling vault supporting a roof with five decorative cupolas. Although the interior was ransacked during the early Soviet period, some of the 19th-century wall paintings have remained, and the icon screen has been recreated. The construction of the church included an elevated, arcaded passage known as the Dormition Gallery that led from the cathedral to the Metropolitan's residence and refectory. The rebuilding of Krutitsky Court continued under Evfimii, who was metropolitan between 1688 and 1695. He was one of the 17th-century prelates who made no apologies for a display of the wealth and beauty of the Orthodox Church, which at this time witnessed a revival of ceramic decorative art. The effusive use of ceramic decoration was often interpreted as a preview of the beauty of paradise itself. Perhaps nowhere in Russia was this revival more lavishly displayed than in the "Teremok," built above a gateway leading to the courtyard of the Metropolitan's Chambers (palaty). Begun in 1693, the Krutitsky gateway was completed shortly before Metropolitan Evfimii's departure in 1695 to become Metropolitan of Novgorod and Velikye Luki. The north façade of the Teremok, which included two pairs of windows, was covered in almost 2,000 polychrome tiles, including ceramic columns. The bays of the façade were divided by carved limestone columns with a grape vine motif, symbol of the Eucharist. The pitched wooden roof above the Teremok was clad in dark ceramic roofing tiles. The architects of this display were Osip Startsev and Larion Kovalyov, and the design of the ceramic tiles has been attributed to Stepan Ivanov. It should be noted that the main, north façade receives direct sunlight only in the summer, yet the variety of the ceramic tiles is perhaps best perceived in indirect light. The late 17th-century expansion begun by Pavel II at Krutitsky Court also included the rebuilding on the foundations of the earlier Dormition Cathedral of a refectory known as the Cross Chamber (Krestovaya palata; 1665-1689) because of the cross vaults that supported the ceiling of its dining hall. Attached to the north of the refectory was the small Church of the Resurrection, a remnant from the earlier cathedral. These various components were united by the building of the Metropolitan's Chambers, a two-story residence with a pitched roof begun by Paul II. In 1727, the residence gained a more imposing, elevated entrance with a stairway and porch in an early Baroque style. The residence overlooked a courtyard with an ornamental garden, one of the first of this type in Moscow. Although a half-century of work had created a unique architectural setting, the travails of Krutitsky Court were far from over. In 1721, Peter the Great abolished the Russian Orthodox patriarchate, a move that led to the demotion of Krutitsy from a metropolitanate back to a diocese. Then, in 1737, a catastrophic fire (the Trinity Fire) caused serious damage to the ensemble, including the Teremok, whose ceramic roofing was replaced with sheet metal. During the church administrative reforms of Catherine the Great, the dioceses of Sarsky , Podonsky and then Krutitsy were abolished, and the Krutitsy ensemble was transferred to the War Ministry. Only the Dormition Church continued to function, and it too suffered major damage from the 1812 fire during the French occupation of Moscow. The establishment of Soviet power brought new threats to Krutitsy, whose military barracks compound continued to function. Paradoxically, the restoration of the Moscow Patriarchate (part of the separation of the Church administration from the Soviet state) led to the creation of the Metropolitanate of Krutitsy and Kolomna as an administrative arm of the Patriarchate. A new era in the history of Krutitsy began in 1947 when the restoration of the ensemble was declared a national priority and entrusted to the leading specialist Peter Baranovsky. In 1982, the ensemble was placed under the administration of the State Historical Museum, and in 1991, Krutitsy was returned to the Russian Orthodox Church. Restoration of the main space of the Dormition Church was completed in 2007 As in the 19th century, the Krutitsky Barracks military post coexists with Krutitsky Court. Today, preservation work gradually continues at Krutitsky Court, closely related to the Moscow Patriarchate. Despite the many threats to its existence over the centuries, fate has spared this peaceful enclave, which bears witness to so many dramatic events in Russian history.